"This works great for camping or with large crowds. Saute onions, red peppers and green peppers to mix with the grilled marinated flank steak. It works with chicken, too!" this marinade even works well with chicken, just add alittlr mexican chili powder. It didn't taste Mexican at all. I don't think Worcestershire sauce works in a fajita marinade, and it definitely needed some chili powder or something to spice it up. I did not care for this...the worcestershire sauce and lime juice were the dominant flavors. It doesn't taste like fajitas. Needs spices. Good stuff! I made it twice and it was a hit both times. We used tri-tip steak and it turned out well. The flavor was good and the meat tender. We added "Mexican Seasoning" to the meat right before grilling. This added a little more zip to it. 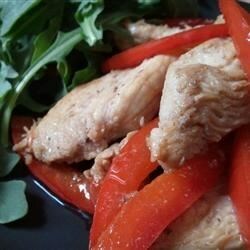 My husband is a very picky eatter and he really liked this recipe. And I liked that I can make this at the drop of a hat and not worry about having a powdered mix on hand. Thanks! I dumped all the listed ingredients in a bag, marinated in the bag, and cooked the meat in the juice. It came out great. The ingredients do sound odd, but it does work.